Mr Spock, the half Vulcan-half Human Science Officer on board the USS Enterprise in the original Star Trek was played by Leonard Nimoy. Famous quotes from Spock are "Fascinating" and "If you eliminate the impossible, whatever remains, however improbable, must be the truth. " 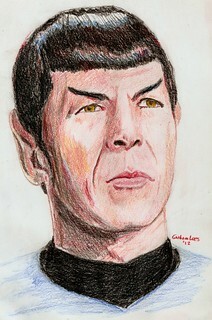 Spock is probably the most recognisable of all Star Trek characters.